The world population is ageing progressively and rapidly. As long as fertility continues to remain low, the proportion of senior citizens will continue to increase. The number of people who turn 60 each year is nearly 58 million worldwide, which is equivalent to almost two persons every second. In 2012, people aged 60 or over represented almost 11.5 percent of our total global population. By 2050, the proportion is projected to double to 22 percent. By 2050, for the first time, there will be more senior citizens than children below the age of 15. 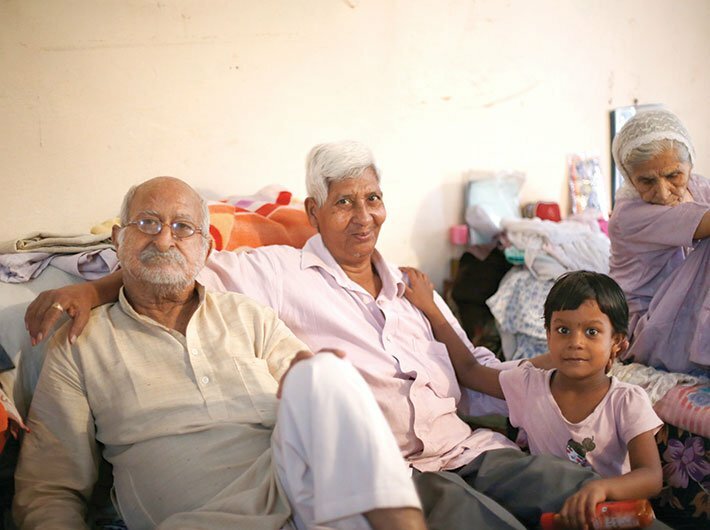 The population of senior citizens in India is currently the second largest in the world after China. According to Census 2011, senior citizen population is 8.6 percent of the total population. Between 2001 and 2026, it is projected that the proportion of population aged less than 15 years will decline from 35.4 percent due to decrease in fertility, while the proportion of middle (15-59 years) and older ages (60 years and above) will increase considerably. With the decline in fertility, along with the increase in life expectancy, the number of senior citizens is expected to increase by more than double from 71 million in 2001 to 173 million in 2026 – an increase of their share to total population from 6.9 percent to 12.4 percent. The senior citizen population faces a number of problems. These range from an absence of secure and sufficient income to support themselves, ill-health, absence of social security, loss of social role and recognition and the non-availability of opportunities for creative use of free time. The needs and the problems of the senior citizens vary significantly according to their age, socio-economic status, health and other such background characteristics. Old age is a natural process. In many countries this phenomena has been considered a matter worth serious attention of policymakers of the government. As the number of older people grows, we need to realise that there are many subsequent serious issues related to the situation. India is facing several challenges in the form of weak economic growth, weak pension system, and null infrastructure for the ageing people, and above all lack of political will makes life miserable for the senior citizens in the country. Problems of ageing usually appear after the age of 65 years. In this age senior citizens face medical, economic, social and psychological problems. Moreover, old age dependency ratio is increasing and it is projected to increase continuously, with higher share from rural areas than in urban areas. The National Sample Survey Organization (NSSO) in its 2006 report revealed that a higher percentage of males in rural areas (32 percent) are found to be financially fully dependent as compared to that in the urban areas (30.1 percent). Widows, the poor and the disabled elderly constitute more disadvantaged among the elderly population. Elderly women, especially widows, face many disadvantages, like a substantial gender differential exists in the ownership of property and assets and in the role and participation in the family as compared to aged men in both urban and rural India, which consequently affects their access to various basic necessities like food, housing and health. 1. An increase in exemption of interest income on deposits with banks and post offices from Rs 10,000 to Rs 50,000. 2. The tax deducted at source (TDS) is not required under section 194A. The benefit will also be available for the interest accrued from all fixed deposit (FD) and recurring deposit (RD) schemes. 3. The budget proposed to increase deduction limit for health insurance premium and/or medical expenditure by Rs 20,000 from the current limit of Rs 30,000 to Rs 50,000 under section 80D of Income Tax Act, 1961. 4. A rise in the deduction limit for medical expenditure for certain critical illness from Rs 60,000 (senior citizens) and from Rs 80,000 (very senior citizens) to Rs 1 lakh for all senior citizens. This provision falls under the section 80DDB of Income Tax Act, 1961. 5. The health protection scheme that will offer Rs 5 lakh worth secondary and tertiary treatment is also likely to rescue most of the ageing population of the country. In the budget 2018, finance minister Arun Jatiley proposed to increase the investment limit in PMVVY to Rs 15 lakh from Rs 7.5 lakh. He also proposed to extend the PMVVY till March 2020. The PMVVY is meant for senior citizens and offers a guaranteed interest rate of 8 percent. The Life Insurance Corporation (LIC) started offering the PMVVY from May 2017. The scheme was supposed to remain open for subscription for one year. Now, with the proposed extension, it will remain open till March 2020. Financial planners say PMVVY offers more avenues to senior citizens to earn a steady regular income at a time when fixed deposit interest rates are not that attractive. PMVVY can be purchased offline as well as online through the LIC of India. The scheme provides an assured return of 8 percent per annum payable monthly (equivalent to 8.30 percent per annum) for 10 years. The pension is payable at the end of each period, during the policy term of 10 years, as per the frequency of monthly/quarterly/half-yearly/yearly mode as chosen by the pensioner at the time of purchase. Currently, in the monthly mode, an investor in the PMVVY gets a monthly interest rate of Rs 5,000 if he/she invests Rs 7.5 lakh. At the end of the policy term of 10 years, the pensioner gets back the purchase price (the amount invested to earn pension) along with final pension instalment. On death of the pensioner during the policy term of 10 years, the purchase price will be paid to the beneficiary. Currently, a loan up to 75 percent of purchase price (amount invested to earn pension) is allowed after three policy years to meet the liquidity needs. The PMVVY also allows for premature exit for treatment of any critical/terminal illness of self or spouse. On premature exit, 98 percent of the purchase price will be refunded. Old age is an inevitable stage of human life. The age which is often dreaded as an inescapable prison should be made a phase of vacation, where senior citizens can enjoy and have their loved ones to care for them. This cannot be achieved through administrative means only. The real solution is not creating new laws and provisions, but it lies with the people themselves. If they start treating the old age people with respect and love then this problem will cease to exist. Dr Sasikala Pushpa is MP (Rajya Sabha). Dr Ramaswamy, former pro vice chancellor of APG Shimla University, is legal advisor to the MP.